Sale FC 2ndteam season has been one of contrasting fortunes in these early stages of the Cotton Traders Premier League campaign. Most weekends they have been able to field full teams, which consists of players who make up the larger part of the squad each week with the team’s 1stteam squad members being rotated in and out of the side, as and when necessary. This week however, the team had to provide their 1stteam squad contingent back to the 1’s. Having been depleted by players going to the 1’s, it meant that the 2’s would have a youthful outlook going into the game against a much stronger opponent in Macclesfield 2’s. With the squad having only 3 or 4 senior players in Captain Ben Simpson, John Blanchard, Tyler Lovatt and Mike A J King, the average age of the squad was around 21 years of age including a large handful of last season’s colts and MMU students completing the lineup, therefore creating an opportunity for these guys to step up and showcase what they could do. In the early exchanges Sale looked like they were going to do well, creating many chances with the lion’s share of possession allowing Fly Half Callum Ramsey to work the corners, giving the home team excellent territorial advantage. Equally adept at putting Macclesfield on the front foot was his counterpart Hamish Burke, who should have scored after the referee awarded Macc a penalty advantage for hands in the ruck, only for him to have been adjudged to have knocked-on close to Sale’s five metre line. After the scrum from Burke’s error, Sale were themselves awarded two penalties on the bounce allowing Callum Ramsey to kick for the corner with Sale having a lineout on the Macclesfield 5m line. At the lineout Sale win the ball cleanly, setting off the backs to attack the visitor’s line, after some intricate moves and a number of phases initiated by the youthful backs, the pass came back to Captain Ben Simpson to register Sale’s first points of the game with a try on 5 minutes. Callum Ramsey added the extras and Sale were off to the best possible start and a 7-0 lead. 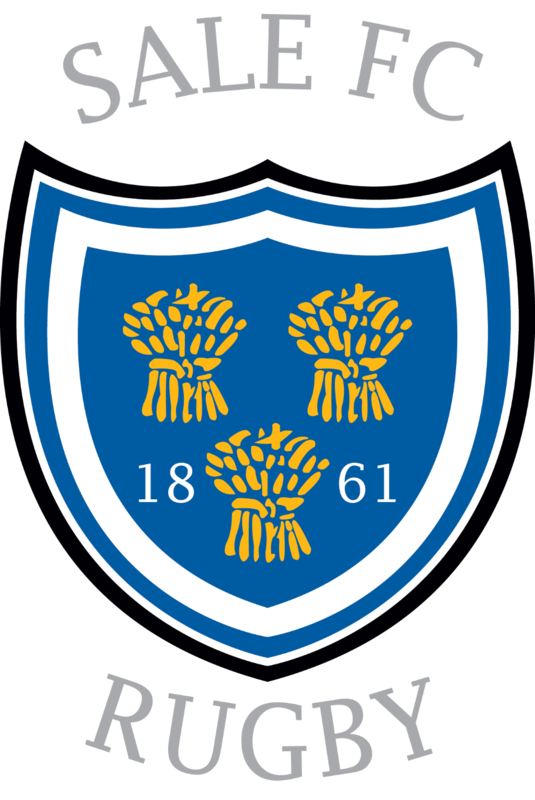 From the subsequent restart, Macclesfield pushed Sale back hard and took possession up towards the Sale 10 metre line, going through 12 phases before the ball was thrown forward to their try scoring winger Lloyd Coates. This slight error only prevented the inevitable some three minutes later as Macclesfield once again went through the phases allowing their prop Billy Robinson to crash over for the equalising score. The extras were added by Jack Taylor and the score was now 7 each after only 10 minutes on the clock. With the scores now level, it was definitely game on and it was Macclesfield who scored next with some intricate back play allowing their No.13 to score unattended, Jack Taylor put over the extras and it was Macclesfield who took the lead 7-14. Here, the lead didn’t last more than a couple of minutes as Sale went on the attack thanks to some excellent territorial kicking from Callum Ramsey, and the backs linking up with the forwards to put Full Back Joe Horsfall over close to the posts. Ramsey missed the extras, but Sale were back in the game now at 12-14. Unfortunately for Sale the next 18 minutes or so was the turning point in the game, as Macclesfield crossed on three more occasions as they looked to exert their experience and pressure on Sale’s youthful side, thanks to tries from prop James Cross (20 mins), Lloyd Coates (27 mins) the first of his five tries and Second Row Paul Davenport (38 mins) with goal kicker Jack Taylor only adding one kick to the tries leaving the visitors with a 31-12 lead at the break. During the 18 minutes where Sale conceded 17 points, it must be said that Sale worked hard to reduce the arrears further via the efforts of No.8 Tyler Lovatt, Scrum Half Harry Stainton and Centres Jarrod Townson and Alex Davidson only for their efforts to be halted due to the defence provided from the opposition. After half time Sale looked like they were on the ropes here, and ready to take the count as their much more experienced counterparts had taken control of the match via their 2ndquarter efforts. However, it was Sale who started the second half off much more positively, working the ball through the phases moving them up the field towards Macclesfield’s 5m line, only for them to lose possession at the crucial moments of this particular passage of play. Over the next couple of minutes, Sale worked hard to get themselves back into the Macclesfield 22m area, only for them on both occasions to be once again be turned over at the crucial moment. On the second occasion Macclesfield were able to run the ball back up the field and cross the try line through Lloyd Coates for his second try of the match, Jack Taylor was able to add the extras and Macclesfield’s lead grew to an unreachable 26 points. This seemed to spur on the much more experienced Macclesfield side, who went on the charge from the next restart only for ex colt Jayden Gunn to charge Burke’s kick down and win the ball back for Sale momentarily, before Sale were turned over easily and put immediately on the back foot as Macclesfield looked to ensure their lead was added to. On 50 minutes, Macclesfield were reduced to 14 men for 10 minutes as the referee was unhappy with the no arms tackle from prop Billy Robinson on John Norton who was heading towards the line. After further good work, and a period of pressure exerted by Sale, the referee lost patience with the Macclesfield defence and gave the home side a penalty try for their efforts following on from two penalties at the breakdown. This was to be the final score for the home side and little reward for their efforts during the game, in which they tried their hardest under testing circumstances against a much more experienced outfit. As Macclesfield continued to go through their paces tackles were missed frequently, and possession was taken away from the home side with ease, as the home side’s heads dropped as Macclesfield broke the home side’s resolve, leading to further scores from Winger Pete Hardwick (59 mins), Lloyd Coates (62 mins 3rdtry – team’s 50 points), Lloyd Coates (71 mins his 4thtry), Lloyd Coates (73 mins his 5thand final try), Pete Milne (74 mins), Paul Davenport (76 mins his 2ndtry) leaving the home side with a 74-19 thumping at the final whistle. When you have players taken from your regular squad up to the first team and players becoming unavailable on the morning of a game and just not showing up, it leaves you picking from the rest of the squad, who with an average age of 21 years have little experience at this level but are willing to give it their all for the cause. Looking ahead to next week’s match versus Sedgley Park, we will re-group at training and make up for this week’s loss, hopefully letting us get back to winning ways. Unfortunately today however, we didn’t do ourselves any favours and lost to a much more experienced side, that taught the younger players what they need to compete in this competitive Cotton Traders Premier League.